Thank you for your interest in and support of Tustin Dance Center (TDC). The TDC policies for the 2017-2018 sessions are outlined below. Please contact us if you have any questions. Class tuition rates are posted on the main policies and tuition page, and apply to the 2017-20181 regular and summer sessions for the period September 1, 2017 – August 31, 2018. An annual, non-refundable registration fee of $20.00/student will be included in the September billing for existing students enrolled at that time. The registration fee will be for new students will be included at the time of enrollment. Families and individuals will be billed on or about the 27th of each month for the next month’s tuition. Payment is due on the 1st day of the month, and a $15.00 late fee will be applied for all tuition payments received after the 10th of the month. Tuition is a monthly fee and is based on an average of 4 weeks per month. There is no additional charge for a 5-week month, nor is there any adjustment for 3-week months resulting from holidays or breaks. A $35.00 fee will be charged for all returned checks. Families are encouraged to sign-up for automatic payment which helps to ensure timely payment each month. Please inquire about automatic payment at the studio or by calling 714-544-3072. Families may cancel enrollment at TDC provided a 2-week written notice is given. See the Cancellation policy below for more information. A maximum of one trial class is available to each new student. Trial classes may be requested by completing the Kindermusik or dance trial request form on the TDC website, by sending an email to tdcfrontdesk@gmail.com or by completing a form at the TDC front desk. All trial requests must be confirmed by TDC before the requestor may attend a class. A trial class is a free class. Individuals wishing to enroll after the trial class must pay the annual $20 registration fee, and tuition will be prorated for the trial month. Please see the Tuition Policy above for more information. Thank you for your interest in Tustin Dance Center. Students desiring a private lesson must schedule the lesson with the appropriate instructor. Coupons for admission into the private must be purchased in advance from the front desk according to the prices listed on the tuition page. The coupon must be given to the instructor prior to the beginning of the private lesson. If no front desk staff member is on duty at the time of the private lesson, a check payable to ‘Tustin Dance Center’ may be given to the instructor with the Instructor’s name, and the date and time of the private lesson written on the memo line. 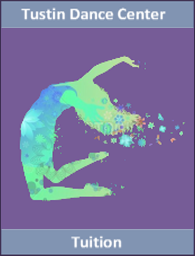 Students requesting choreography for a special event, a recital dance or a competition are required to pay a $125.00 choreographer’s fee. This fee will include compensation for choreographic research, music purchasing, music editing, and the choreographer’s creative process. Fees will be made payable directly to the instructor at the time the private lessons are scheduled. Ballet. 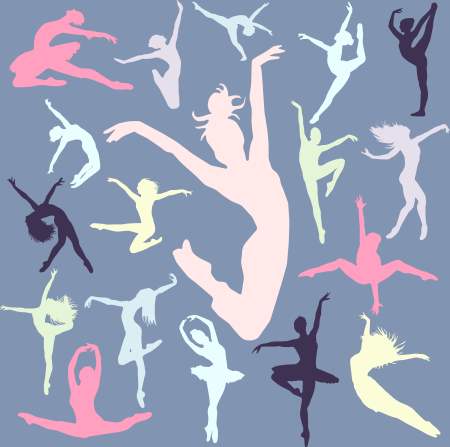 Female dancers: Leotards and tights with hair combed back and secured in a tight, clean bun, with pink Ballet shoes. Male dancers: Black tights, white t-shirt, black Ballet shoes. Tap. Leotards and tights, or leotards with Jazz shorts; black Tap shoes. Jazz. Leotards and tights, or black Jazz pants/shorts; black Jazz shoes. Hip-Hop. T-shirt or tank top with Jazz pants, shorts or sweatpants (no jeans); tennis shoes. TDC dancers are not permitted to wear inappropriate clothing to class and to TDC performances, and under no circumstances are dancers allowed to reveal bare midriffs. Dancewear, dance bags, shoes and accessories are available for purchase in our studio store – ‘The Backstage Boutique’. If you miss a class, you may request a Make-Up Slip (available at the front-desk), which may be used for any class appropriate for that student. Make-ups may be taken any time within 30 days of a missed class or holiday, but there are no refunds for missed classes. Make-up slips may be used 2 weeks prior to a missed class or holiday, however, the make-up slip is not valid if the student is not currently enrolled in a class at TDC, or if there is an outstanding balance due. Classes may be closed or combined if there are fewer than 6 students enrolled. Class time may be reduced to 35 – 45 minutes on any given day in which 4 or fewer students are present. If you cancel your enrollment in the studio or drop a class, you must do so in writing a minimum of 2-weeks prior to the 1st of the month. Failure to do so will result in a full billing for the following month and there will be no pro-rata adjustments. As noted above, there are no refunds for the annual registration fee or for Recital costume orders. Students who are absent three consecutive times in any class without notice may be automatically dropped from that class. ‘Dropped’ students who wish to return to class are required to re-enroll, and may only do so if there is room in the class and upon re-payment of an additional registration fee. Visitors may observe classes through the viewing windows at the studio, however it is recommended that observers limit viewing time, as dancers are aware of your presence and can become distracted from their lesson. Observers may only enter the studio during class with prior permission from the instructor, or in the event of an emergency. Parents are responsible for the supervision of non-dancing children at the studio at all times. Please treat the studio and the other families also present with the care, respect and safety each deserves. The waiting rooms and lobby at TDC are intended to provide a nice, comfortable and peaceful environment for parents, dancers and siblings waiting for students. Please exercise the care, respect and safety that the studio and the other families deserve at all times so that all may relax and enjoy their visit to TDC. To this end, we ask that there be no running or jumping on furniture, and that loud noise be kept to a minimum (we realize that babies often don’t abide by our minimum noise rule!). No food or drinks are allowed in the lobby or waiting rooms other than what is sold at TDC. Thank you very much for your cooperation and support of Tustin Dance Center! The studio is closed the week before Labor Day, Thanksgiving weekend, Christmas, and Easter breaks (as set by the Tustin Unified School District), Memorial Day, the Fourth of July, and the week after the annual Recital. The studio is generally open on Martin Luther King Day, President’s Day, Columbus Day, and Veteran’s Day. Our annual Recital is held in late June, and we encourage friends and relatives to attend and to celebrate and enjoy the accomplishments of the students. For this exciting event, we rent a large theatre (e.g., Servite High School) and create a big production to showcase the many dancers who have worked so hard throughout the year. Recital tickets are available for purchase online or at the theatre box office on day of event. Please make ticketing inquiries at the studio, by calling 714-544-3072 or by looking for updates on www.tustindance.com. Recital participation by each student is optional, but the decision to participate must be made at the time costumes are ordered (typically in January each year). Costumes must be paid for in advance at the time of ordering and there are no cancellations or refunds on costume orders. Your account balance must be paid in full prior to the Dress Rehearsal in order for your child to participate in the Recital. Tustin Dance Center proudly produces The Nutcracker Ballet annually each December. For this wonderful family event, we rent a large theatre (e.g, Orange Lutheran High School), and celebrate the festivities with multiple performances. Studio participants also perform a number of ‘Nutcracker in a Nutshell’ performances prior to the main event around the Tustin, Irvine and Santa Ana communities (e.g., Tustin Tree Lighting Ceremony, Boys and Girls Club of Tustin, Enderle Center Holiday Open House). We also hold two other fun events prior to the Nutcracker performances including the ‘Sugarplum Fairy Tea Party’, and the ‘Nutcracker Gala’ for parents, patrons and donors. Auditions by studio dancers for The Nutcracker Ballet take place each summer in July and August. All Nutcracker roles are important and earned. The Director awards all roles based on each dancer’s audition and skill level and the overall needs of the show. Roles awarded are not negotiable. The production also includes local and national professional dancers for some of the primary roles. The Nutcracker tickets go on sale in September and may be purchased online or at the theatre box office on day of event. Please make ticketing inquiries at the studio, by calling 714-544-3072 or by looking for updates on www.tustindance.com. We regularly photograph and/or videotape our annual Recital and The Nutcracker Ballet, and classroom activities. These photos and videos are usually posted on the Tustin Dance Center website (www.tustindance.com) and/or may be used in promotional materials (printed and electronic). Unless specifically prohibited in writing by parent or guardian, enrollment in Tustin Dance Center gives ‘Tustin Dance and Music Center LLC’ permission to use photos and videos of your child(ren) for promotional and/or communication purposes. Welcome to Tustin Dance Center! TDC is a family-owned business that prides itself on treating each family with respect and consistency, and by providing your children with excellent music and dance instruction. We work hard to make sure your children work hard, increase their skill and have fun at TDC. We truly appreciate your patronage. Click on the link below to view the 2017-2018 Tustin Dance Center tuition. Tustin Dance Center offers year-round classes. Click on a below to learn more about what we offer and to view the schedules for our summer classes, summer dance intensives and summer camps. If you are looking for new dance studio to call home, we’d love to earn your trust and your business. We encourage you to drop by the studio so we can talk, get acquainted and answer your questions. You can also trial a class to see how you like it before you make your decision.